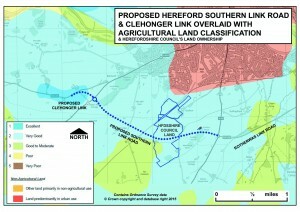 This map shows the proposed Hereford Southern Link Road and Clehonger Link overlaid with the “Ecological Network” map produce in 2013 by Herefordshire Council.It also shows the Herefordshire Council Land ownership. “Unsound” Local Plan Approved after Pressure from Westminster? This map shows the AVERAGE ANNUAL DAILY TRAFFIC FLOWS (AADTs) from a 2012 baseline and with the construction of the Southern Link Road in both 2017 and then 2032. All data has come from Herefordshire Council’s consultants Parsons Brinkerhoff as part of the planning application for construction of this new £27million road. 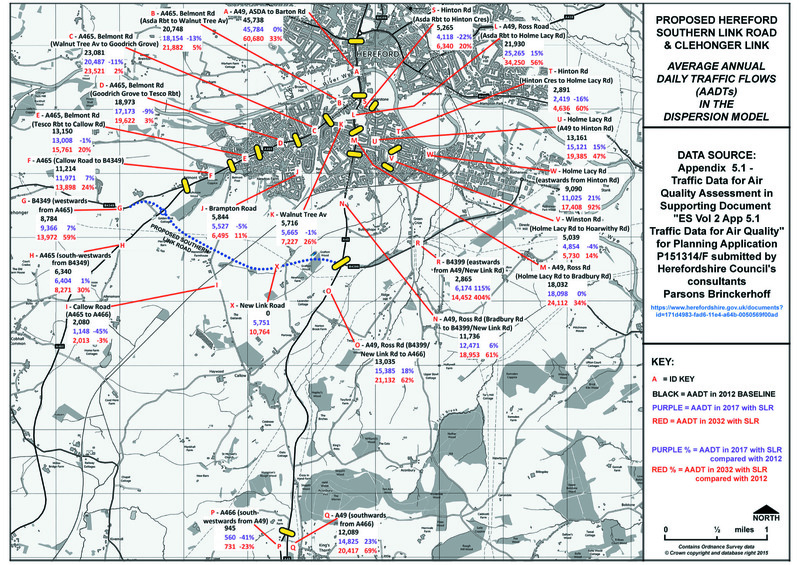 Modelling and forecasting traffic is very complex so we are trying to keep it simple. a. A465 Belmont Road traffic on the would decrease by 13% (on section B below the Asda gyratory). b. A49 Ross Road Traffic would increase by 15% ( on the section L below the Asda gyratory). 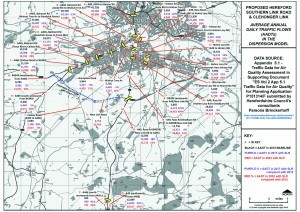 THIS MAP SHOWS: The Southern Link Road and Potential Housing Development sites from the Strategic Housing Land Availability Assessment (SHLAA). 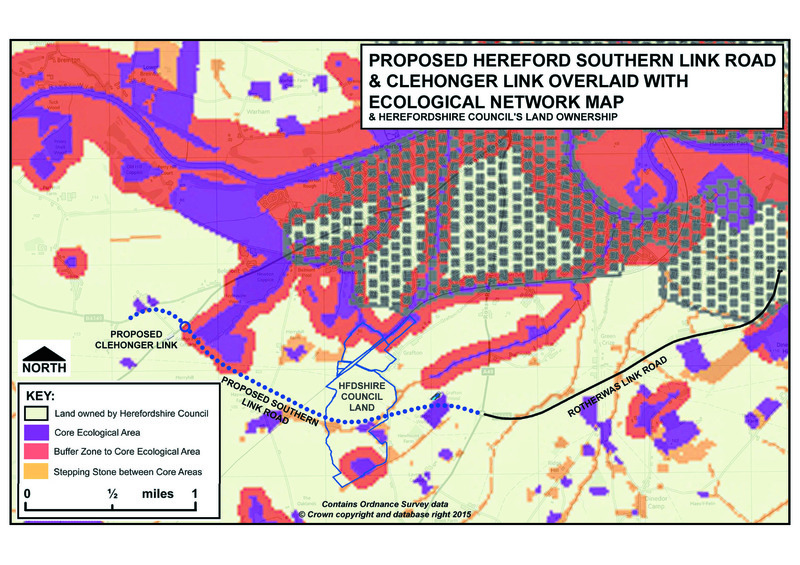 THE MARCHES LEP AND HEREFORDSHIRE COUNCIL STATE THAT THE SOUTHERN LINK ROAD WILL ‘UNLOCK LAND FOR HOUSING’. THIS CAN ONLY BE TRUE IF THERE IS GOING TO BE SIGNIFICANT HOUSING DEVELOPMENT NEAR THE SOUTHERN LINK ROAD WHICH HAS NOT YET BEEN REVEALED. a. The Southern Link Road (and Rotherwas Link/Access Road) act as “Distributor” Roads to open up land for significant housing around Hereford. 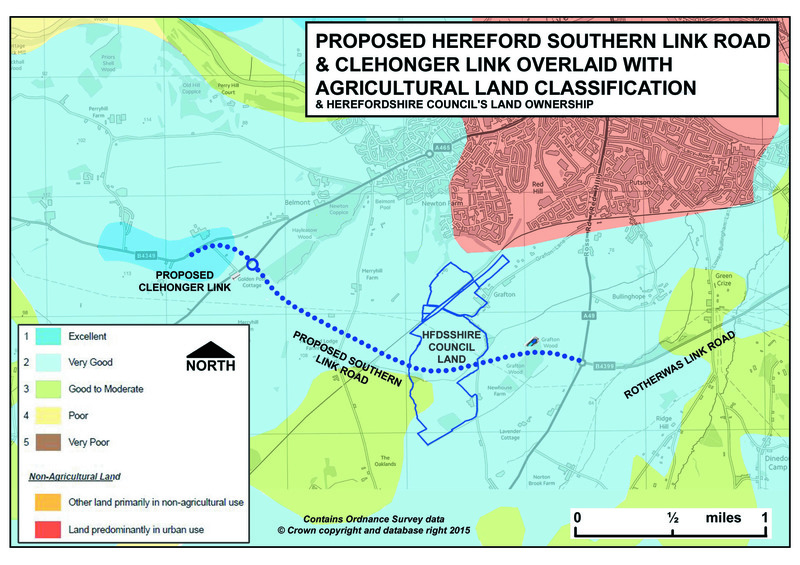 areas, the total potential for houses on the SHLAA sites would be 12,705.
c. The Southern Link Road traverse the small holding land in Herefordshire Council’s ownership which could deliver a further 2,310 homes. Total housing potential is 15,015. Core Strategy is 1,000 MINIMUM. So the 14,015 house building potential is currently not explicit in any plan. 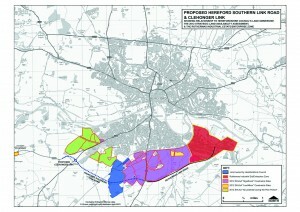 However, the total number of houses to be delivered for Hereford is a minimum of 6,500 to 2031. 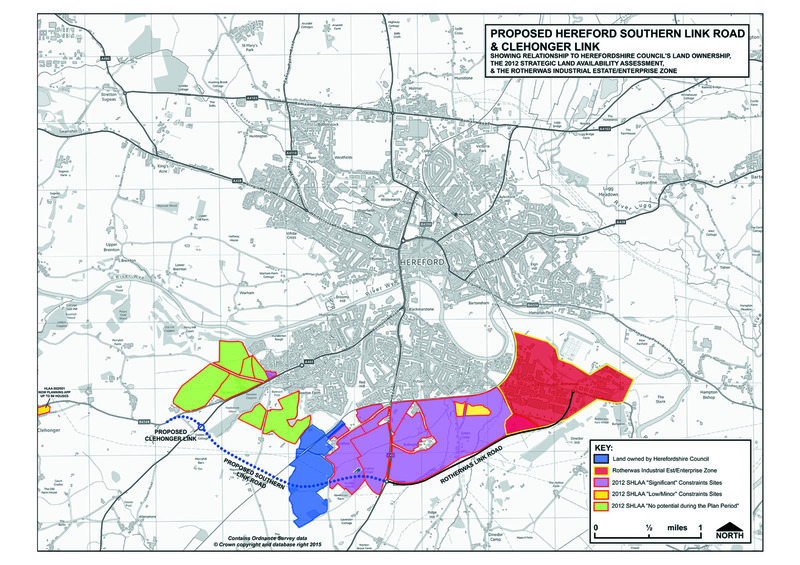 With Herefordshire Council needing the new Homes Bonus to fund the Southern Link Road expect delivery of new house building within the Southern Link Road area. d. Traffic from these houses will still need to access Hereford for work, schools, hospitals or shopping so do not be fooled by claims that a Relief Road will enable that. 85% of traffic in Hereford is “internal” i.e. starting and finishing journeys within the City. Any so-called ‘Relief Road’ will not go into Hereford. e. The “constraints” which could prevent delivery on these SHLAA sites are likely to disappear under the Core Strategy and the National Planning Policy Framework rules.